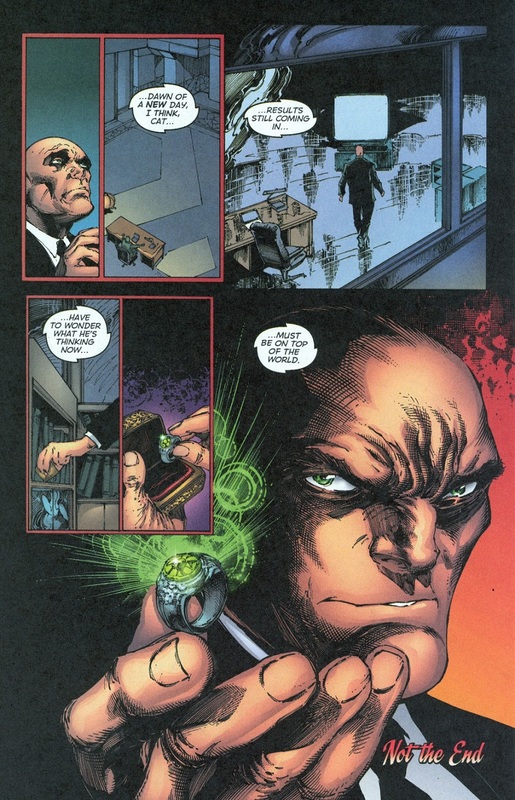 scans_daily | "One or the Other"
Bruce, don't make an ultimatum, just steal the ring without Luthor knowing who took it. D.E.O. is the Department of Extranormal Operations. They try to keep tabs on metahumans without being too intrusive about it, depending on what Mr. Bones and Cameron Chase want to do at the time. Is "Keyhole" something from DC Comics? I can't find anything on it, I think it might just be tossing something in if anyone wanted to use it. Wasn't Keyhole a set of satellites with high-power cameras doing a Google Earth during the Cold War? There was SO MUCH wasted potential with Luthor as President. This scene teased something with no payoff. In the long run, what could've been a great series of stories wound up being a tiny handful. Like the issue where he orders Superman to do a mission in a war-torn country. 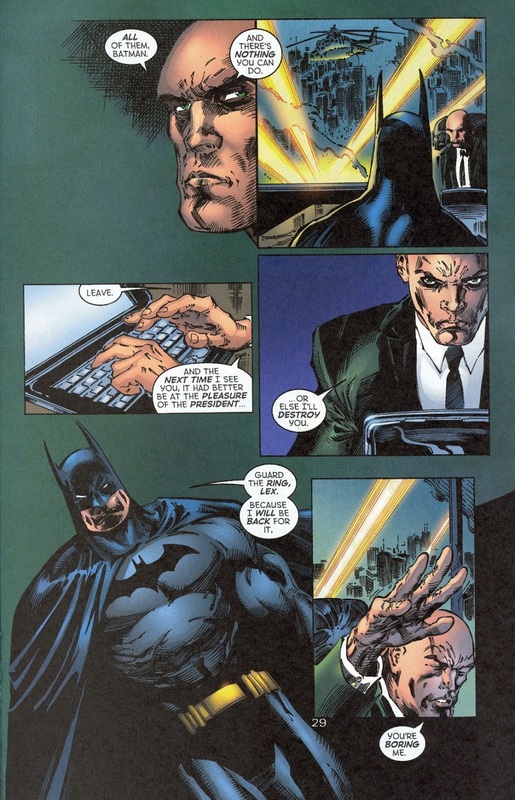 And then the "payoff" is he suddenly goes completely off the rails crazy with no build up or explanation, dons his power suit, and it all ties in with Infinite Crisis. Yea, it had some good stuff- I liked his role in OWAW- but not enough. For a better take on basically the concept, IDW had Starscream elected ruler of Cybertron. Five years, *tons* of payoff. 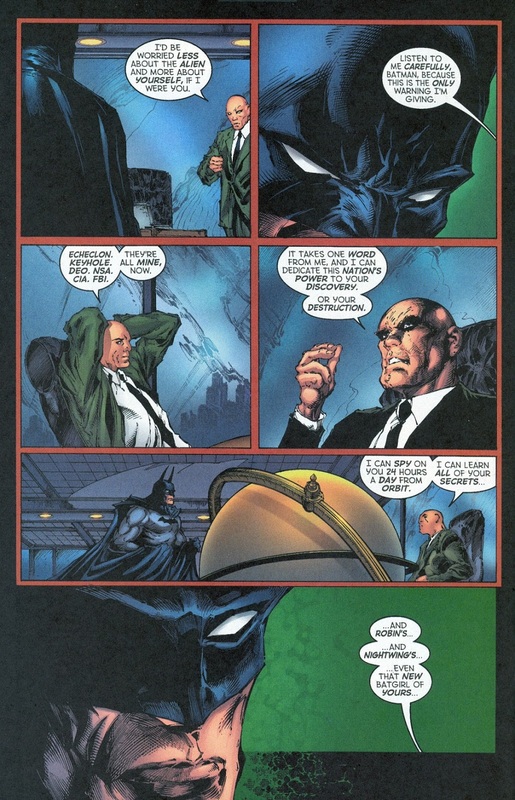 Lex Luthor, preening in the security of being ensconced in legitimacy that superheroes can't dislodge him from directly. It's everything tedious about post-Crisis Luthor, magnified. I've been slowly falling out of love with "untouchable" CEO Luthor for the last two or three years or so, and I think this is definitely the nadir. As Chris Sims noted, the premise pretty much requires the JLA to be asleep at the wheel for an entire election cycle. Though, come to think of it, a future adaptation might smooth things out by having all/most of Earth's superheroes fight some cosmic threat for several months, while Luthor is left "taking care of" the homefront? Who did the art on this? There's a strong Todd McFarlane feel to that last page.